Due to a security incident, the websites for the World Socialist Movement and the Socialist Party of Great Britain are currently down for extended maintenance. 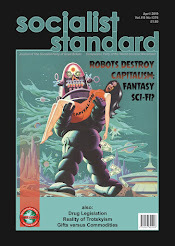 The Socialist Standard published without interruption since 1904, was therefore unable to publish the web version in the usual manner on their website. 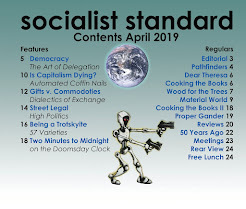 So this is for the time being, an unusual version, using the Socialism or Your Money Back blog to deliver backup pages in real time. We will to be back on our own websites propagating socialism,very soon, we have never stopped, with important historical archival material dating from 1904 to the present day. Anti-semitism: What it is and What it isn't. Cooking the Books 1: When did capitalism start? Material World: Ortega – The new Somoza? 50 Years Ago: What! No Money! Permissive land-use policies and cheap farm acreage here have helped catapult Brazil into an agricultural superpower, the world's largest exporter of soy, beef and chicken and a major producer of pork and corn. Brazil's agriculture sector grew a sizzling 13 percent in 2017, while the overall economy barely budged. The nation's ability to keep producing new farmland cheaply has given it an edge over rivals and cemented its status as a vital supplier to the world's tables. Known as the Cerrado, roughly the size of Mexico, straddling Brazil's mid-section from its far western borders with Paraguay and stretching northeast towards the Atlantic coast, the Cerrado has seen about half of its native forests and grasslands converted to farms, pastures and urban areas over the past 50 years. The home to 5 percent of species on the planet, this habitat lost more than 105,000 square kilometers (40,541 square miles) of native cover since 2008, according to government figures. That's 50 percent more than the deforestation seen during the same period in the Amazon, a biome more than three times larger. Accounting for relative size, the Cerrado is disappearing nearly four times faster than the rainforest. Cerrado's frontier region known as Matopiba, shorthand for the northeastern Brazilian states of Maranhao, Tocantins, Piaui and Bahia. Land here is cheap. Virgin plots near Pansera in the state of Tocantins can be had for $248 an acre on average, according to agribusiness consultancy Informa Economics IEG FNP. That compares to an average of $3,080 per acre for already cleared farmland in the United States. The largest savanna in South America, the Cerrado is a vital storehouse for carbon dioxide, the greenhouse gas whose rising emissions from fossil fuels and deforestation are warming the world's atmosphere. Brazilian officials have cited protection of native vegetation as critical to meeting its obligations under the Paris Agreement on climate change. But scientists warn the biome has reached a tipping point that could hamper Brazil's efforts and worsen global warming. "There's a high risk for the climate associated with this expansion," Alencar said. "Limiting and calling attention to deforestation in the Amazon, in a way it forced the agribusiness industry to expand in the Cerrado." The toll can already be seen in the region's water resources. Streams and springs are filling with silt and drying up as vegetation around them vanishes. That in turn is weakening the headwaters of vital rivers flowing to the rest of the country, scientists say. The imperiled waterways include the Sao Francisco, Brazil's longest river outside the Amazon, where water levels are hitting never-before-seen lows in the dry season. "The removal of vegetation can lead a body of water to extinction," said Liliana Pena Naval, an environmental engineering professor at the Federal University of Tocantins. Mercedes Bustamante, an ecologist at the University of Brasilia, said "You lose the accumulated evolutionary record of thousands of years that never can be recovered." Farmers continue to plow under vast stretches of the biome, propelled largely by Chinese demand for Brazilian meat and grain. The Asian nation is Brazil's No. 1 buyer of soybeans to fatten its own hogs and chickens. China is also a major purchaser of Brazilian pork, beef and poultry to satisfy the tastes of its increasingly affluent consumers. Government policies have intentionally driven industrial-scale farming here. Short on farmland to feed its growing population, Brazil in the 1970s looked to its vast savanna, a region early explorers had dubbed "cerrado," or "closed," because of its tangled woodlands. Farmers have emerged as a powerful political force bent on keeping Brazil's countryside open for business. Lawmakers in the country's largely rural, pro-agriculture voting bloc, who comprise more than 40 percent of the nation's congress, have led a rollback of environmental laws in recent years. Those efforts include a 2012 loosening of Brazil's landmark Forest Code that sets requirements for preserving native vegetation. The change reduced potential penalties for farmers, ranchers and loggers charged with past illegal deforestation, and made it easier for landowners to clear more of their holdings. Annual deforestation in the Amazon last year was up 52 percent from a record low in 2012. Cerrado farmers are required to preserve as little as 20 percent of the natural cover, and up to 35 percent in areas neighboring the Amazon. Those who don't maximize use of their tracts risk having their land declared idle and subject to redistribution under a 1980 federal land-reform initiative aimed at assisting rural, low-income people, said Elvison Nunes Ramos, sustainability coordinator with the Ministry of Agriculture. Environmentalists say the Cerrado's wooded grasslands have failed to capture the public's attention the way the Amazon's lush jungles have. People view the Cerrado "just as bushes, twisted vegetation and shrubs," lamented Alencar, the science director at IPAM. We stand with ALL workers. Expressing concern for "fiscal sustainability" just months after signing a tax bill that is expected to add $1.9 trillion to the national debt over the next ten years,Trump announced that he is canceling pay raises for nearly 1.8 million federal workers because he claims "federal agency budgets cannot sustain such increases." Labor activists argue that the $25 billion Trump claimed the pay raises would cost is a drop in the bucket compared to the GOP's enormous gifts to the rich. Trump's decision to cancel the modest 2.1 percent pay raises that were set to go into effect in 2019 comes as wages for most workers are either completely stagnant or declining. Meanwhile, corporate profits are soaring to record levels, the stock market is booming, and CEO pay remains sky-high. The American Federation of Government Employees (AFGE) noted in a statement that the president's move completely ignores the fact that federal workers "are worse off today financially than they were at the start of the decade. Federal employees have had their pay and benefits cut by over $200 billion since 2011, and they are earning nearly five percent less today than they did at the start of the decade." Every 2 minutes three children will die from pneumonia, the leading infectious cause of child mortality globally, killing more children than diarrhoea and malaria combined. In 2016, the disease killed an estimated 880 000 children. Most were younger than 2 years old. Almost all pneumonia deaths could be prevented through vaccination or early diagnosis and treatment with antibiotics costing less than $0·50. Yet childhood pneumonia deaths are falling far more slowly than other major killers. On current trends, there will be 735 000 pneumonia deaths in 2030. Pneumonia barely registers on the radar of global health priorities. No major aid donor has taken up the reins of leadership on pneumonia. Nor is this a disease that galvanises high-profile international campaigns asserting the rights of children at risk. Severe pneumonia is the ultimate disease of poverty. The children at greatest risk are drawn overwhelmingly from the most disadvantaged sections of society. They are more likely to be malnourished, and the least likely to be immunised, accurately diagnosed, and treated. Evidence from south Asia also points to marked gender disparities in treatment rates, with boys accounting for a far greater share of hospital admissions for pneumonia than predicted by disease incidence. This reflects wider social and cultural practices that lead to delays in parents seeking medical help for girls. The more affluent with the strongest political voice in shaping health priorities are insulated from pneumonia risks. Unlike cholera, measles, or HIV/AIDS, severe pneumonia is not easily transmitted across social boundaries. The fact that pneumonia mostly affects impoverished rural areas and urban slums, where communities have limited potential for political mobilisation, diminishes the stake of middle-class constituencies in public action. While prioritising pneumonia makes sense in terms of national health benefits, cost-effectiveness, and equity, these are not the primary drivers of political choice. Interest groups with specific diseases and concentrated urban populations with a political voice are more successful in asserting their claims than highly dispersed, rural, and poor groups confronted by poorly understood disease. Pneumonia is not only socially contained within countries, it is also a disease that poses no global epidemic risks through transmission across borders into rich countries. This matters because the aid priorities of high-income countries are highly sensitive to perceptions of the health security interests of donors. In short, pneumonia is a disease that can be contained in poor communities of poor countries—and this is a prescription for public policy inertia. What is clear is that the continued neglect of pneumonia by national governments and the international community will ensure the SDG pledge to end preventable child deaths becomes a broken promise. The British Dental Association says a "huge fall" in people on low incomes going to the dentist in England is because they fear being wrongly fined when they claim for free treatment. The BDA says the system of fines, usually of £100, is creating a "hostile environment" for the vulnerable. The most recent annual figures show almost 370,000 fines for people accused of "misclaiming" for free dental care. But dentists say many of these are innocent confusions over paperwork and that many are overturned when challenged. Dentists have warned that simple errors in filling in a form can lead to fines being issued - and they say that these are making people afraid to seek dental care, even though they are exempt from charges. The BDA says that this is driving a downturn in visits to the dentist by low-income people, falling by 23% over four years. This represents two million fewer treatments in 2017-18 compared with 2013-14. The number of fines increased more than tenfold across four years - from almost 34,000 to 365,000. The fines for wrongful claims are intended to stop fraudsters and to make sure no-one who should pay for treatment is avoiding charges. "This huge fall in NHS attendance amongst patients exempt from NHS charges is the logical outcome of failed government policy," the BDA's chairman of general dental practice, Henrik Overgaard-Nielsen, said. "Ministers have created a hostile environment for vulnerable groups and those on low incomes who have a right to free dentistry. These patients, often with complex needs, require early intervention not the ever-present threat of fines," he said. Last year, dentists and patients contacted the BBC to warn of how the fining system was becoming a barrier to dental care. There were complaints from distressed families that vulnerable people, such as those with dementia, cancer patients and people with multiple disabilities, could face fines as a result of simple errors or confusion over forms. Charlotte Waite, a senior dentist working in Loughborough, Leicestershire, told the BBC this was a problem appearing on a "daily basis". Only three Unexplained Wealth Orders have been served in the six months since the instrument’s introduction. Five enforcement and investigation bodies – the National Crime Agency, HM Revenue & Customs, the Serious Fraud Office, Financial Conduct Authority and Crown Prosecution Service – were granted special powers to freeze assets and require the super rich to explain the origin of their wealth. So far only one, the National Crime Agency, has used them, and that was in relation to just one person, the wife of an allegedly corrupt banker. This despite claims by ministers the new powers would see them mount a “full spectrum” assault on McMafia-type criminals and corrupt oligarchs. In 1994 Gordon Brown, the then-shadow chancellor, announced a Labour administration would crack down on the use of loopholes to avoid tax. Two decades later, Britain still counts among its dependencies several of the world’s most aggressive tax havens, and we actively promote our appeal as a low taxation regime for wealthy foreigners, to encourage them to settle here. The UK simply do not show the desire, commitment and purpose to pursue white-collar crime. It has never given prosecutors tools regarded as standard in other jurisdictions. The City of London, too, is full of lawyers, accountants and financial advisers who specialise in defeating investigators and hiding wealth. To assist them, we have a hideously detailed tax code – more convoluted than that of India – which is full of get-outs and exclusions. And the UK has ready access to those vestiges of empire we continue to protect, and are now international boltholes for those seeking secrecy, or wishing to avoid tax. Transparency International says it has identified £4.4bn worth of British properties linked to criminals or “politically exposed persons”. Hit them with UWOs and it’s easy to see the property market collapsing. So far, not even one of the three issued has been enacted. It faces legal challenges galore before it can begin to be enforced. UWO is in danger of becoming the financial equivalent of that other no-show, the UFO. A study, published in the Lancet Public Health journal, analysed the projected health needs of the elderly between 2015 and 2035 explains the number of people aged 85 and over needing 24-hour care is set to double, says a new study, as an expert warns the care system is "at breaking point". It found that the number of 65-year-olds and over needing round-the-clock care is also set to rise by a third. The study carried out by Newcastle University and the London School of Economics and Political Science, highlighted the fact that the fastest growing demographic in the UK is elderly people over 85, whose numbers are projected to more than double by 2035, increasing by 1.5 million. Many of these elderly will develop multiple long-term health conditions, with increasingly complex care needs. She warned that relying on unpaid family carers was not sustainable and said: "The challenge is considerable. Our study suggests that older spouse carers are increasingly likely to be living with disabilities themselves. On top of that, extending the retirement age of the UK population is likely to further reduce the informal carer pool, who have traditionally provided for older family members." Nick Forbes, senior vice-chair of the Local Government Association, warned that "Adult social care services face a £3.5bn funding gap by 2025, just to maintain existing standards of care," he said. "The system is at breaking point, ramping up pressures on unpaid carers." Caroline Abrahams, charity director at Age UK, urged the government to meet the challenge head-on and stressed that the burden on families is too great. "The problem is that today there are far too few really effective joined-up services and social care is in sharp decline," she said. "The government's top priority must be to steady the ship and then produce a great set of proposals later this year to give our older population confidence they can get the help they need." A new book on the Rohingya crisis authored by Myanmar’s army’s department of public relations and psychological warfare, shows a photo of A man standing over two bodies, wielding a farming tool. “Bengalis killed local ethnics brutally”, reads the caption. The photograph was actually taken during Bangladesh’s 1971 independence war, when hundreds of thousands of Bangladeshis were killed by Pakistani troops. Reuters found that two of the photos originally were taken in Bangladesh and Tanzania. A third was falsely labeled as depicting Rohingya entering Myanmar from Bangladesh, when in reality it showed migrants leaving the country. An image of Hutu refugees taken in 1996 following the violence in Rwandaas been altered with the caption falsely describing the subjects as Bengalis who have “intruded” into Myanmar after the British colonial occupation of lower Myanmar. Another photo depicting Rohingya and Bangladeshi migrants, who were trying to flee Myanmar, after their boat was seized by Myanmar’s navy, near Yangon, in 2015 appears in the Myanmar army’s new book on the Rohingya. Its caption falsely says the image shows Bengalis entering Myanmar by boat. Qatar has come under immense criticism over the deaths of hundreds of foreign workers at FIFA 2022 World Cup venues. In 2012, 520 workers died in Qatar and over 300 of those deaths remain unexplained. Qatar says workers have died for reasons unrelated to working conditions, such as heart attacks or respiratory failures, but human rights bodies say these are euphemisms for heat-related deaths and argue that Qatar doesn't provide autopsy reports with the aim of hiding the real reasons. Activists have tried to highlight these health issues to the World Cup organizers. DW saw over a dozen workers at work here between 11:30 a.m. and 3 p.m., hours designated as a rest period by the state of Qatar between June 15 and August 31, the hottest time of the year. While experts argue there should not be any work during the day in the harsh summers — when temperatures can rise to 50 Celsius — Qatar itself has banned work during these three-and-a-half hours, accepting they are unfit to work. And yet, DW witnessed a clear breach of law even during the tiny window of reprieve for the workers. Nicholas McGeehan, an expert on migrant workers' rights in the gulf who has researched workers' deaths for Human Rights Watch, was astonished at DW's findings. He sees the violation at a FIFA-linked stadium to be even more serious because FIFA projects are governed by the Supreme Delivery and Legacy Committee, which promises higher standards of welfare for its workers, much more than other contractors. "This incident suggests contractors are not even abiding by the very basic laws," he told DW. McGeehan question if Qatar is serious about changing its attitude toward the work force. "Construction is a conspicuous business — it is visible and loud — so it is hard to believe they felt they could evade detection. The more plausible explanation is that they felt they would escape sanction, and if this is the case it calls into question not only the committee's ability to protect workers but its commitment to that endeavor." Qatar pledged to reform and abolish the so-called Kafala system which monitors workers. Critics say it restricts their freedom of movement and puts them at the mercy of their employers. A major part of the reform was supposed to ensure that the travel documents remain with the workers. In the Barawa camp, most workers say their passports remain confiscated. Just days after DW's visit, a 23-year-old Nepalese worker was reported dead at the Al Wakrah stadium in Qatar. According to one of the main contractors, the man fell to his death while carrying out scaffolding work. United Nations human rights experts have called for China to shut down alleged political “re-education camps” for Muslim Uighurs and called for the immediate release of those detained on the “pretext of countering terrorism”. China has said that Xinjiang faces a serious threat from Islamist militants and separatists who plot attacks and stir up tensions between the mostly Muslim Uighur minority and the ethnic Han Chinese majority. The UN Committee on the Elimination of Racial Discrimination cited estimates that “from tens of thousands to upwards of a million Uighurs” may be detained in the far western Xinjiang province. Independent experts said the panel had received many credible reports that a million ethnic Uighurs are held in what resembles a “massive internment camp that is shrouded in secrecy”. Panel expert Gay McDougall described it at the time as a “no-rights zone”. The detention programme has swept up people on ostensible offences ranging from accessing foreign websites to contacting overseas relatives. Other aspects of the security crackdown include all-encompassing digital surveillance, mass deployment of police and severe regulations against religious customs and dress. The UN panel said it was alarmed by “numerous reports of detention of large numbers of ethnic Uighurs and other Muslim minorities held incommunicado and often for long periods, without being charged or tried, under the pretext of countering terrorism and religious extremism”. It regretted that there was no official data on those detained “for even non-threatening expressions of Muslim ethno-religious culture like daily greetings”. The panel decried “reports of mass surveillance disproportionately targeting ethnic Uighurs, including through frequent baseless police stops and the scanning of mobile phones at police checkpoint stations”. There were reports that “many Uighurs abroad who left China have allegedly been returned to the country against their will”, it said, calling on China to disclose the current location and status of students and asylum seekers who went back. The UN envoy to Syria, Staffan de Mistura, has warned of a "perfect storm" in north-west Syria if the government goes ahead with its threatened offensive against rebels and called for humanitarian corridors to be set up to allow civilians to be evacuated temporarily. Almost three million people live in Idlib where, according a UN estimate, there are around 10,000 al-Nusra and al-Qaeda jihadist fighters. The UN is desperate to avoid the deaths of civilians seen recently in other parts of Syria like Aleppo, Raqqa or the Eastern Ghouta, and its diplomats are pleading with those fighting to show restraint. Foreign Minister Sergei Lavrov said "terrorists" must be wiped out in Idlib, accusing them of using civilians as human shields. Both he and his Syrian counterpart, Walid Muallem, accused rebels of preparing to stage a chemical attack in Idlib in order to blame pro-government forces and draw new US military retaliation. Mr de Mistura said both the government and the rebels had the ability to make chlorine-based chemical weapons. Mr de Mistura said, "There is a perfect storm based on warnings, counter-warnings which is gathering around and due to the dilemma, which is a true dilemma on how to defeat terrorists in Idlib and at the same time avoid affecting a huge number of civilians," he said. "So, while we are aware that efforts and discussions are taking place to avoid the worst-case scenario, one cannot ignore that miscalculations may indeed occur leading to unforeseen escalation and we are all very much concerned." Mr de Mistura offered to go to Idlib personally to set up a humanitarian corridor which, he acknowledged, would mean evacuating people into government-controlled territory. "That area most likely is under government control, so that requires a constructive, effective government support and a UN presence," he said. The so-called nominal wage (i.e. the sum that workers see on their paychecks) has risen only 2.7 percent in the past year, a very mediocre result for the 82 percent of the labor force that is non-managerial workers. The nominal wage is not the worker's real wage, for it doesn't take into account the very real fact that consumer-price increases eat up the buying power of people's paychecks. Indeed, while nominal wages are up 2.7 percent in recent months, the price of everything from gasoline to groceries is up by 2.9 percent, effectively a wage cut. The CEOs of America's 350 largest corporations had an 18 percent jump in their pay, hauling in an average of $18.9 million each. Millions of Americans today -- from Walmart employees to school teachers -- are paid so little that each of them have to patch together two or three jobs to eke out a bare-bones living. In fact, major corporations have made poverty pay central to their profit strategy, with giants like Amazon, McDonald's and Walmart issuing such puny paychecks that their workers have to rely on food stamps and other public programs to make ends meet. That's a corporate subsidy that adds up to roughly $150 billion a year taken right out of the pockets of the American welfare state. corporate chieftains, economists, political leaders and others consider employees as a cost to be cut, not an asset to advance. Working stiffs see the continued offshoring of their jobs and deliberate decimation of their rights and union bargaining power; they see billionaires like Donald Trump and the Koch brothers attack them as "moochers" and "losers"; they see leaders of both political parties whoring for corporate dollars, while rigging the rules to gut everything from overtime pay to health care; and they see their tax dollars pouring into the rapid development of a robot economy that will leave them and their children out in the cold. America needs an all-out labor rebellion. A cavalcade of city mayors, regional government representatives and business executives from around the world will convene in San Francisco next month for a major summit touting the role of action beyond national governments to stave off the worst impacts of climate change. But the greenhouse gas cuts offered up by these entities are relatively modest, according to new research. This action isn’t sufficient to bridge a gap between the Paris agreement’s goal to avoid two degrees centigrade of global warming, with an aspiration of avoiding a 1.5C increase, and the insufficient emissions reductions put forward by the deal’s nearly 200 national signatories. An evaluation of climate change pledges by nearly 6,000 cities, states and regions, representing 7% of the global population, and more than 2,000 companies that have a combined revenue comparable to the size of the US economy, found a total projected reduction of between 1.5bn to 2.2bn tons of greenhouse gases by 2030. In some places this action will be significant. But globally these emissions cuts fall short of enabling countries to avoid breaching agreed thresholds for dangerous warming that will trigger increased heatwaves, mightier storms, rising seas and displacement of people. Even if every Paris commitment is fully implemented, the world is on track to warm by around 3.3C by the end of the century. Pledges by the likes of Berlin, the Coca-Cola company or even an economic powerhouse like California “while welcome, are not sufficient,” said John Sterman, the director of the MIT system dynamics group. Trump unveiled a plan to weaken vehicle emissions standards that could result in more than 1bn tons of extra carbon dioxide over the next 15 years. Last week, Trump’s Environmental Protection Agency announced a watered down climate policy for the energy sector that might even result in emissions rising from coal plants. Russian President Putin seeks to soften the blow of a deeply unpopular pension reform package that increases the retirement age. The government argues that increasing life expectancy puts pressure on the pension system. In a televised address, Putin sought to explain that pension reform "cannot be put off any longer" due to economic and demographic trends. "In the long term, if we hesitate now, it could threaten stability in society and hence national security," said Putin. The pension system "would crack and eventually collapse" if the retirement age were not raised, he said. 90 percent of Russians oppose the reform package increasing the retirement age for women from 55 to 63, and 60 to 65 for men. The proposal is blamed for Putin's popularity rating falling from 80 percent to 67 percent. In recent weeks, there have been rare large-scale protests in opposition to the reform. Putin said the retirement age for women would rise five years to 60, instead of the original proposal of 63. For men, the retirement age would still increase from 60 to 65. Putin also outlined some potential tax breaks for seniors, an exception for women with many children, increasing unemployment insurance for those close to retirement age and measures to protect older people from employment discrimination. Many people worry that they will not live to receive their pensions. Life expectancy for men is only 67 compared to 77 for women. Communist Party leader Gennady Zyuganov explained, with Russian men dying in their 60s "they will all get their pension in their coffins." Normally close to Putin's United Russia, the Communist Party has said that it would still not support pension reform with the new changes and is demanding a referendum on the issue. Russia also faces an impending demographic crisis as a result of low birth rates. Stefan Meister, the head of the Central and Eastern Europe, Russia and Central Asia at the German Council on Foreign Relations, told DW "Ultimately it's about enforcing this reform in one way or another, despite resistance." Many in the Marxist tradition are confused by the question: Should we support the National Liberation Movements in undeveloped countries? To answer this question, we must go to find the essence of a national liberation movement, to know whose profit it stands for, and to know whether it helps implement democratic revolutionary socialism or not. First, what is a "national liberation" movement? Literally, the national liberation movement is the movement that tries to liberate a nation which is a vassal from its overlord. Now here comes the question. Most of the time, it is a completely capitalist state colonizing an undeveloped country, so the national liberation revolution in an undeveloped country is a struggle against the capitalist class of the colonizing power. So why will the people in an undeveloped colony try to struggle against their alien capitalist bosses? That is a historical question. Worker-peasant struggle led by social liberals or by those calling themselves socialists or communists, as in the New Democratic Revolution (1919-1949) in China. Now let us analyse these three kinds of national liberation struggle one by one. Let's take East Asia as an example. The Chinese Emperor, feudal aristocrats and bureaucrats wanted to drive foreign colonists – I Ren (means Barbarian) - out of their Celestial Empire, while the Shogun in Japan wanted to keep Shogunate government away from Nanban (Barbarians from the South). This kind of struggle has never entirely gone away; it still remains even in some countries whose capitalist mode of production is highly developed. For example, in China, there are many Jingshen Dizhu Jieji, which means "Spiritual Landlord", who are trying to restore the feudal culture. In short, feudal anti-colonial struggles were not and never will be on behalf of a progressive mode of production. And of course, such struggles won't help capitalism grow in such colonial states. Even in an extreme situation – that the landlord class becomes the new capitalist class and develops the capitalist mode of production – that will still be slower to develop capitalism and let the working class grow. Therefore, such kind of struggle shouldn't be supported by our proletarian socialists. which, since the capitalist mode of production was introduced by the colonial power, is the main kind of anti-colonialism struggle nowadays. In the colonial country, this mode of production begins to grow. At the same time, a bourgeoisie emerges out of the landlord class, old aristocrats, bureaucrats, and traders.. After that, the contradiction between the bourgeoisie and the semi-colonial-semi-feudal society system becomes more and more intensified. The bourgeoisie in the colonial vassal is angry both with the feudal system which was originally inherent in the colonies and with the colonial system which was brought in by the colonial power. The reason why they are angry is simple: both of these systems stand in the way of exploitation and making money, obstructing them from finishing the primitive accumulation of capital. In fact, even in their colonial power, the bourgeois revolution was also caused by this. However, it is the twenty-first century now, the time of Oliver Cromwell, George Washington, and Napoleon Bonaparte has passed. At that time, those bourgeois revolutionists only needed to defeat feudal landlords in their country, and sometimes an alliance of foreign feudal landlords' union (as in France at the time of the revolution). After that, all they needed was a policy help capitalism grow, and try to capture colonies. But today, the bourgeoisie in colonies and semi-colonies are not so lucky. Not only do they need to defeat the feudal landlords (if colonialism has not already smashed them yet), they also need to defeat their class brothers – the capitalist class of the colonial power. What's more, with the highly developed world market of today, it is not only this capitalist class that is the enemy of the colonial bourgeoisie but capitalist classes all over the world. For example, factories all over the world need rubber from the tropics, no matter whether the state has a colony there or not. If they have one, they will plunder from it directly; if not, they will have to buy from those colonial powers that control the rubber production area. When the bourgeoisie seize power from the colonial state in a rubber-producing colony, they soon find that they can never compete with the other rubber-producing colonies that are controlled by colonial powers. But why are the colonial powers able to sell the rubber so cheap? It's because they have the advantage of scale and information, and they can easily exploit workers in the colonies. It is harder for the bourgeoisie in colonies to get more information from the world market and pay less wages to workers, because they don't have enough capital. Compared with transnational capitals, the bourgeoisie in colonies is not worth a word. To finish the primitive accumulation of capital the bourgeoisie in colonies would have to increase the price of rubber. This would prevent them from competing with other rubber exporting countries, even in an extreme situation – where this colony controls half of the world rubber production – the capitalist class all over the world will unite to smash this independent rubber-exporting country for increasing the rubber price on the world market, which means that industrial capitalists in other states whose industries rely on rubber make less money - a.k.a. extract less surplus value. To the capitalist class all over the world, every cent exploited from the workers counts. Back to the topic of whether national liberation helps implement of democratic revolutionary socialism. As we said above, anti-colonialist struggles which are led by bourgeoisie and petty-bourgeoisies in colonies and semi-colonies just stand for their profit and completing the primitive accumulation of capital. To do this, they will use all kinds of ways to exploit working class to get more surplus value, and at the same time kowtow to the former colonial power and various other world powers, selling the sovereignty of the nation in exchange for some guarantee of independence that can be abolished anytime. The bourgeois state is the tool of capitalist exploitation. Capitalists all over the world use this tool to guard their private property and the right of exploitation. In the developed countries, or the ex-colonial power of these independent ex-colonies, exploitation is limited because of the workers' struggles of the past, and because those states had colonies. But in colonies, there is no 8-hour working day or any Social Insurance Act, and there are also no "kind capitalists". Capitalists in former colonies have such high costs that, when they finally get the right to exploit their working-class fellow citizens, how could they be kind while they have competitors both domestic and foreign? They will try their best to use the police, gendarmes, the army, tear gas and machine guns to repress the resistance of the working class, to guard their right of exploitation and "enjoy life". What's more, if the bourgeoisie in a former colony keeps their state isolated from the world market, this will only lead to the stagnation of the capitalist economy in their country; and if they don't do that, it is just using a local whip to whip the local worker. And moreover, considering the poor and weak capital of local capitalists, letting local capitalists, instead of transnational capital, develop the capitalist mode of production in the former colonies only slows down its pace of development, in other words, slows down the pace of development of capitalism, which means a decrease in the speed of expanding the size of the working class. And we all know that it is the working class that carries out the socialist revolution, so fewer workers mean a later revolution and a later socialist society. So that there is no reason for us socialists to support the capitalist struggle either. Worker-peasant anti-colonial struggle with some "socialist" content. Now here comes the most controversial part. Was Mao Zedong a socialist? Was Fidel Castro a socialist? Was Abdullah Öcalan a socialist? In my personal opinion, they were revolutionists but not working toward real socialism. When a worker-peasant struggle is launched and is successful in a semi-colony or colony, mostly it was because the bourgeoisie there was too weak and incompetent. In that circumstance, there will be social liberals even calling themselves socialists to take the lead in a revolution. Such a revolution is a bourgeois revolution but led by elements from the petty-bourgeoisie, working class or peasant class. It will use some promises of social reform to appeal to some progressive petty-bourgeois and workers to join the revolution, but will also use some state capitalist slogans to attract the reactionary petty-bourgeois, peasant, handicraftsman, and even the landlords and local bourgeois. What slogan you use, what friends will you have? China has fallen into a bureaucratic capitalist police state after 1976, while before that it was a state capitalist country. The National Assembly of People's Power in Cuba has just passed a new constitutional amendment which allows the existence of private property. Economically, socialism means collective social ownership of means of production, and equal access for all to the products. This kind of anti-colonialism leads either to ordinary capitalism or to keeping a state isolated from the world market. However, without the success of the revolution in the centre of the world market – the United States of America, the European Union and China – keeping a state away from the world market will only make it waste much resources on trying to substitute for foreign capitalists. In the twentieth century, the Soviet Union and the first Chinese Peoples' Republic helped such struggles in many countries, which made it possible for some of those revolutionary states to keep themselves from being overthrown. However, after the Kremlin stopped helping its red pets in Asia and Africa, and Beijing took the capitalist policy of Reform and Openness, these rebel capitalist states quickly collapsed. As the first "Socialist" (but in fact state capitalist) state, the Soviet Union adopted Joseph Stalin's rapid industrialization policy to remedy the drawbacks of keeping Russia away from the world market completely or at least partially. However, during the Great Depression, the Soviet Union imported a great number of machines from the Western Europe, and recruited thousands of engineers and technicians from the United States. During the World War II, though the Soviet Union was the biggest industrial state in Europe by size, and the second biggest in the world, it still accepted Lend-lease Act aid to reinforce its military industrial production. That meant that even Stalin could not prevent being influenced by the world market while constructing his "socialist" but in fact state capitalist state. 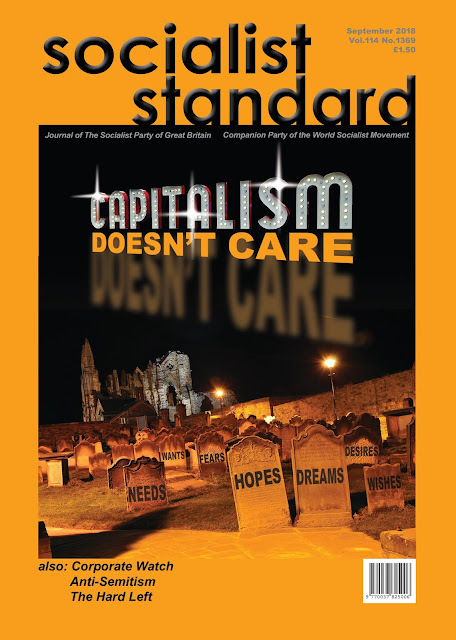 Is Capitalism about to disappear? Who Isn't Paying for Integration?